Once you register and start a course you will have 21 days to complete the course. Once you complete Level I you can proceed to Level II etc. You will have 21 days to complete the next Level and so on. You can purchase a 10 day extension for any Level for $25. You can also review any Level for 7 days for $35. Have you been mystified why patients who have further potential do not progress following traditional therapy approaches for balance, postural, motor and perceptual problems? Why do persons not respond to therapy to weight bear on their affected side following a TBI or CVA? Why does a person with Parkinson’s disease lean forward and shuffle their feet rather than take a normal stride? Why do some children toe-walk? Why can a person, who has 20/20 vision, see a bug or piece of lint on the floor but not find the door or person in the room? While we tend to think and attend through our vision, how does the motor-sensory system relate to our vision? Does vision affect postural tone, movement and balance? Can movement and postural tone affect our vision? This workshop will explore the area of vision least understood. How vision can affect movement and postural relationships and how a new means of therapy, Neuro-Visual Postural Therapy, can affect posture, movement, spatial orientation and even binocularity.Vision is the primary process for organization of space and time related to posture, movement and balance. Following a neurological event such as a CVA, TBI, MS, CP, Parkinson’s disease, etc., the visual process can become compromised affecting spatial organization. This can directly affect balance and posture as well as the ability to organize space for higher visual and cognitive processing. This spatial dysfunction can also cause difficulties with binocular function of the eyes and interfere with the visual skills used for problem solving a spatial environment that most of us take for granted. This spatial visual processing dysfunction can cause Post Trauma Vision Syndrome (PTVS) and Visual Midline Shift Syndrome (VMSS). This workshop/course will explore the relationship of the visual-spatial process and its primary role in rehabilitation following a neurological event. The relationship between vision and postural organization of flexion and extension leading to postural tone (normal and abnormal) will be demonstrated. 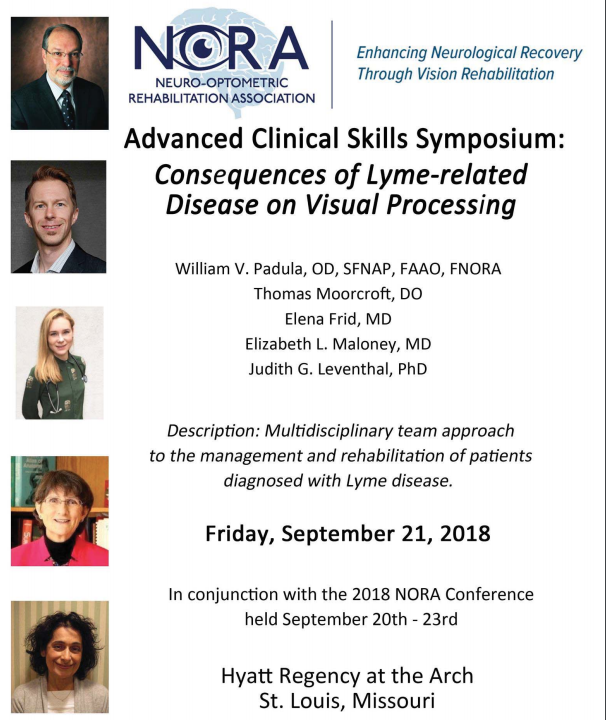 It will also demonstrate how lenses and prisms can affect neuro-visual processing dysfunction and how the proper prescription can directly affect potential of therapeutic outcome to maximize potentials. A new approach in therapeutic intervention will be demonstrated called Neuro-Visual Processing Therapy (NVPT). While research will be used to emphasize the evidence-based level of understanding, this course is a practical demonstration designed to advance the optometrist and therapist through videos, case studies, and workshop demonstrations in therapy techniques and use of lens/prism prescriptions. A special emphasis will be given on prescribing yoked and asymmetrical yoked prisms for the optometrist. Visual field loss and spatial neglect will be analyzed from both the conscious cognitive perspective and the preconscious spatial dysfunction underlying the behaviors. Emphasis will be placed on the need for inter-professional (interdisciplinary) approaches to serve patients with neurological dysfunction. Learn three models of vision applied to neuro-rehabilitation. Name the two modes of visual processing applied to neuro-rehabilitation. Describe the compensatory method of using prisms and the neuro-Visual Postural method of using yoked prisms. Define the relationship of vision to development affecting postural alignment. Demonstrate how to analyze posture. Define Visual Midline Shift Syndrome (VMSS) and the cause of this syndrome related to posture. Demonstrate how to assess posture through observation and technology in relationship to Visual midline Shift syndrome (VMSS). Create a chart demonstrating the correct application of prisms to posture. List the symptoms and characteristics of Post Trauma Vision Syndrome (PTVS) and its affect on the motor system. List eight ways in which visual midline can shift affecting posture and balance. Discuss tow methods of using prisms to affect PTVS and VMSS. Define facilitated movement with yoked prisms and the affect on proprioception. Course Design: This online course is a workshop format. Three course programs will be given that are successive and that will build on the skills and understanding of the participants. It is not necessary to sign up for the full program in order to take the initial level. However, in order to complete the course, Course 1 through Course 3 must be completed in succession. 3-Part Workshop: Padula Institute of Vision is pleased to bring you Part 1 of a 3-Part workshop.